PEOPLE’S Rainbow Coalition presidential candidate Joice Mujuru has disclosed that MDC-T presidential candidate Thokozani Khupe snubbed her proposal for a coalition ahead of the July 30 polls. This came against the backdrop of earlier reports suggesting that the two had held talks in Bulawayo, but failed to agree on the leader of the proposed union. Speaking on Thursday at a Zimbabwe Election Support Network (Zesn) discussion on women’s participation in the forthcoming elections, Mujuru said she was the one who approached Khupe with a coalition deal through an unnamed emissary. “I had gone out of my way to invite Khupe, but it was never accepted. I did send the word through her emissary and I didn’t get any response,” the former Vice-President said. 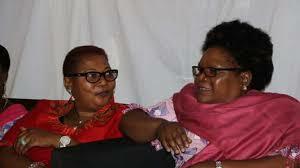 Both Khupe and Mujuru were among the four female candidates contesting for the presidency on July 30, with critics having blamed women for failing to rally behind a single candidate in order to disrupt the patriarchy, which has for decades dominated national politics. With 54% of the registered voters being women, analysts have argued that the fate of the country will be determined by the female vote. Khupe, however, denied having received any coalition proposal from Mujuru and went on to downplay the notion of mergers ahead of the July 30 election, saying the reality was that there were 23 presidential candidates from which the electorate could choose. She said it was important to drive efforts towards campaigning because elections were fast approaching and there was no time to adjust operational arrangements and rally behind a single female candidate. “She (Mujuru) articulated the issue clearly that she went through somebody else, but what I would like to say is that let us look at reality, we have 23 candidates. So are you saying that the others are not going to be splitting the vote?